I generally don’t do organized tours but decided to take the classic Nanny approach and go on the Boston Duck Tour. 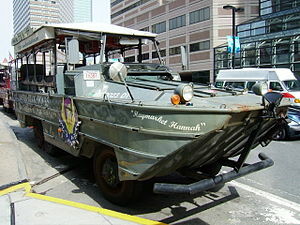 Duck Tours are conducted on military ducks which are half land/half sea vehicles-like a platypus or Aqua Man. They used ‘Ducks’ to storm the beaches at Normandy-like the hotel here on Charles street that used to be a jail-does not conjure up romantic images. The fun is, after you drive around town (land part), you get to drive into the Charles River (sea part). Be warned, if you decide to go on the Duck tour yourself, they are WILDLY popular. You really do need to book thirty days in advance. It was only because it was mid-week in March, we were able to book the day before, but the boat was full by the time we got there. 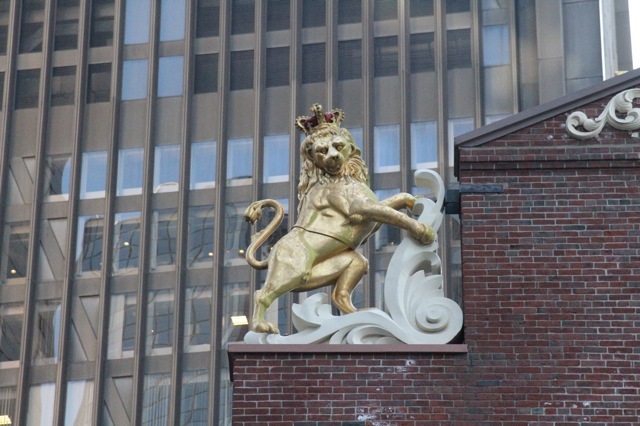 Below is a brief overview of the most interesting tidbits about Boston from our well worth it tour-and a few things we stumbled on by ourselves. 1. 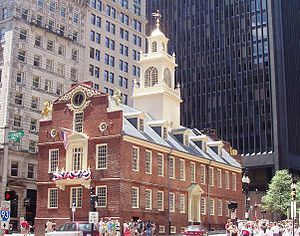 The Old State House. This original State House was built back in the day (1717) and has a tiny balcony where the Declaration of Independence was read out to the people for the first time. This is also the site of the Boston Massacre (1770) which fueled the Revolutionary War. The story changes depending on which side you were on. 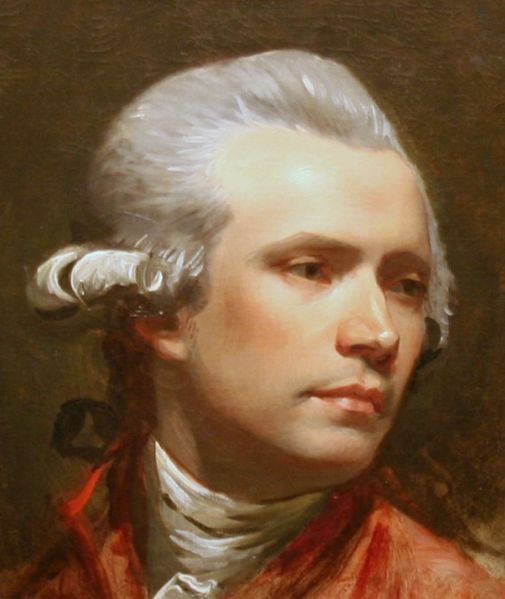 Some say English soldiers randomly opened fire on an innocent crowd of Bostonians. Others say the English were attacked by a Boston gang that turned into a mob, so the English were engaged in self-defense. Either way, the colonialists were tired of the English by then, so the story didn’t go away. It spurred future Revolutionary events and proves the political tool of ‘spinning’ events in one’s favor goes WAAAAAAAYYYY back. 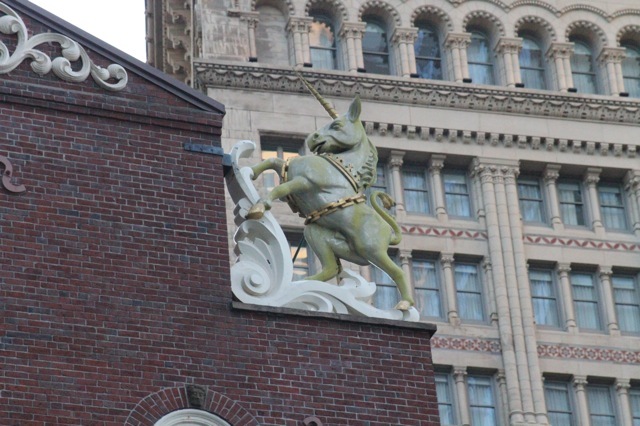 My favorite part of the Old State House is the Lion/Unicorn statues on top. Originally symbols of England, they were torn down and burned when victory was announced for America in the Revolutionary War. 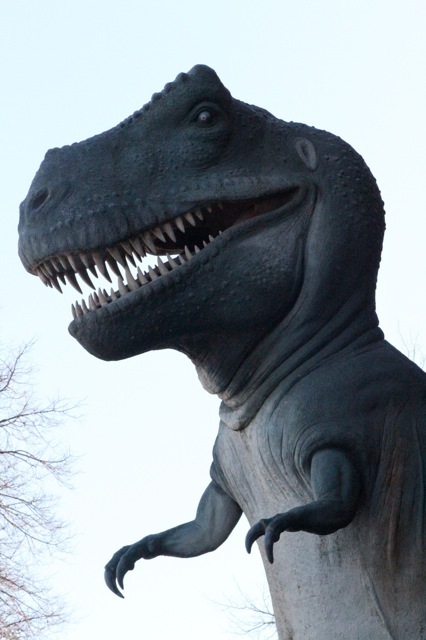 Then people thought, “Hey, we like those statues.” So they cleaned them up and put them back. This tavern claims to be the oldest in America and the only place you can enjoy a Sam Adams beer while over looking his grave. 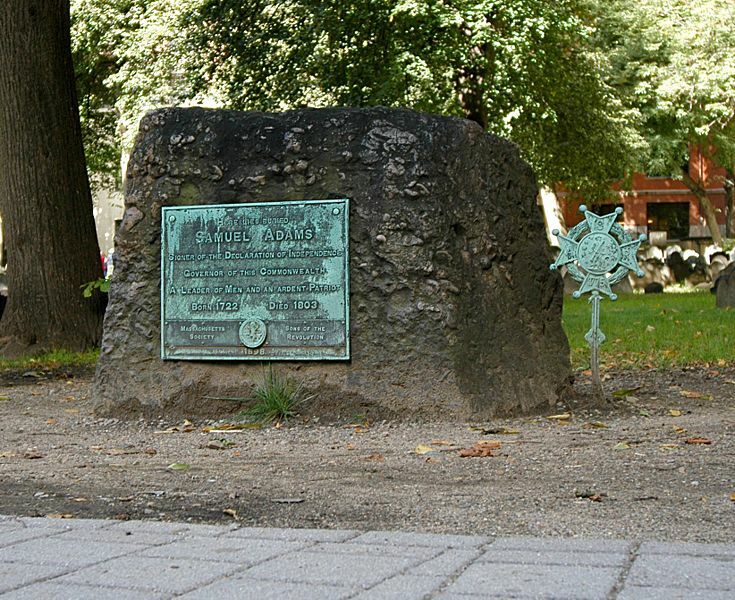 Samuel Adams is buried across the street in the Granary burial ground. 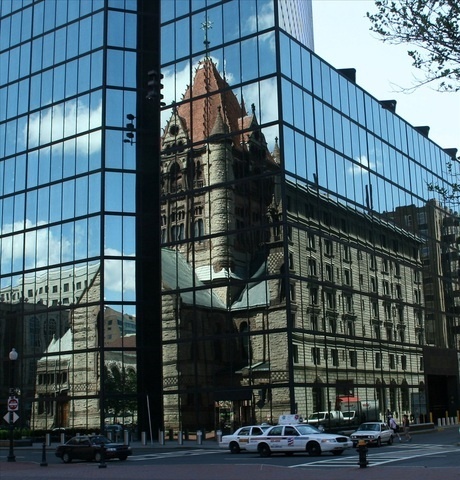 The Back Bay section of Boston was built on a landfill in the 1800s and took forty years to complete. It’s about two hundred years older than the original town of Boston-including Boston Common and Beacon Hill founded in the 1600s. The public space of Copley Square was donated by John Singleton Copley, the prominent-and very dashing-portrait artist from Boston on the left. Across the street is the John Hancock building designed by I.M. Pei, who decided he couldn’t compete with the architecture of Trinity Church next door. He made his building out of mirrored glass to reflect the historic church-to very nice effect. On another side of Copley Square is the Boston Public Library-worth a peek inside for the architecture alone. 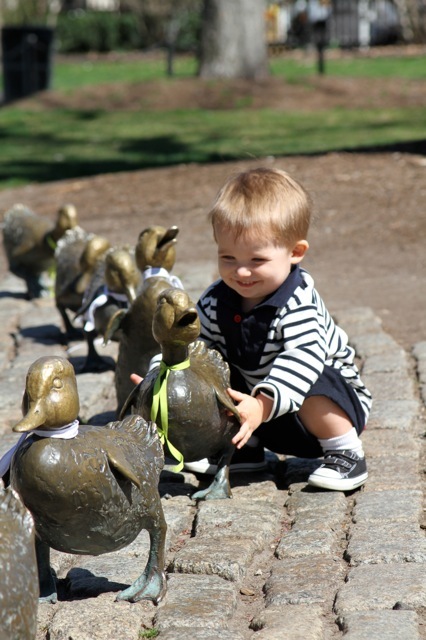 We LOVE the Public Garden. Luckily, we arrived during a freakish spring snap and saw the garden at its best: manicured lawns, topiary hedges, flower beds. It wasn’t teeming with people, so it had an intimate feel to it- room to breathe and soak it all in. Founded in the late 1800s as part of the Back Bay, it’s a good two hundred years older than its neighbor, the Boston Common. Charles Street divides the two parks. This garden holds special meaning for me (and many others) because as a girl one of my favorite books was Make Way for Ducklings by Robert McCloskey. 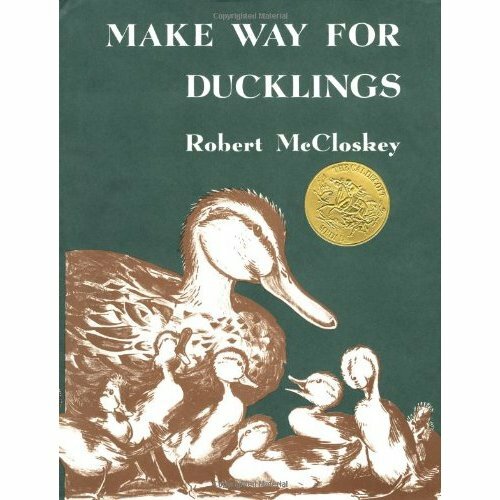 I honestly didn’t realize until recently this book was based on a family of ducks who lived in this very real Public Garden. To see, in real life, the pond and the little island where the ducks lived was nothing short of magical. Those drawings are indelible. They have a statue to commemorate the ducks and claim it’s never been professionally polished because children sit on the ducks so often. Our son tried to take one.